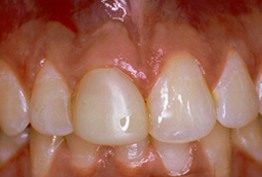 Before: The front Central tooth on the left has a poor restoration. It’s not contoured properly to match the gumline of the rest of the teeth, leaving it looking somewhat unnatural. 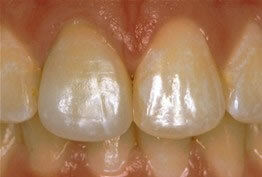 After: Replaced with a non-metallic All Porcelain Crown. The restored tooth looks natural and matches the shape and color of the patient’s teeth and gumline. Before: The image shows the patient needed Upper Arch Rehabilitation. 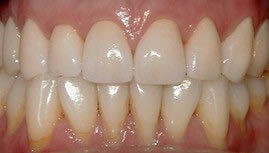 There is gumline recession present and the Upper Anterior teeth are stained. 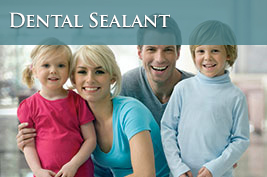 The incisal edges, or tooth edges, are chipped and worn down. 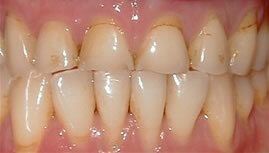 After: Patient smile restored with placement of eight Upper All Porcelain Crowns, also called Caps. 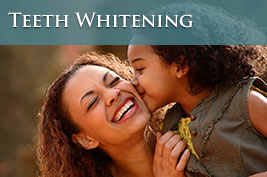 The gumline and incisal edges are now uniform, giving the patient longer, better shaped teeth which enhance the smile line and aid in chewing and biting function. 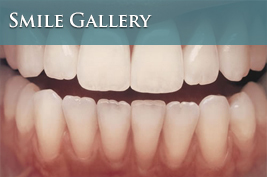 Before: The right Upper Central Incisor needs a Single Tooth Replacement. After: A Single Implant and an All Porcelain Crown, which fits securely over the implant, restores both the smile and function. Before: The image above shows a patient who needs Upper and Lower Arch Rehabilitation. After: The mouth now has a great smile, chewing function as well as facial tissue support which is possible with an Upper Denture, supported with Implants and Lower Implants and Crowns. Before: Looking at the lower left section of the mouth one can see the patient needs Upper and Lower Arch Rehabilitation. After: The Patient now has a great smile, chewing function as well as facial tissue support, which is possible with an Upper Denture, supported with Implants and Lower Implants and Crowns.